Everybody has a bad day once in a while. Celebrities have to have those days in public, alas! Here’s who messed up in front of the whole world this week. And who came up smelling like roses. His upcoming movie, the Kathryn Bigelow-directed Detroit, is sitting at 95% approval on Rotten Tomatoes; furthermore, Boyega bought his parents a house this week. The British-born actor is close to his folks, Samson and Abigail, who emigrated from Nigeria to South London. After Detroit, Boyega will next be seen in December in Star Wars: The Last Jedi, bringing the character of Finn to life again. Maybe we’ll just keep him permanently on the Winner list? Schumer was the only woman on the Forbes Top 10 list of highest-paid comics. She was in fifth place with annual earnings of US$37.5 million. Seinfeld was #1 on the same Forbes list, thanks to annual earnings of $69 million. Chris Rock came next, followed by Louis C.K. and Dave Chappelle. That’s a lot of laughs, funny people. The actor (Moonlight) has signed on to star in the third series of HBO’s True Detective. When the head of the Boy Scouts of America has to apologize for the remarks made by the President of the United States, you know the world is in a precarious state. Trump also endeared himself to the 15,000 transgendered soldiers in the U.S. armed forces by reinstating a military ban on transgender people. Big week for a guy so quick to call other people loooosers. It’s been a tough few days for the Biebs. The pop star cancelled the remaining 14 stops on his Purpose tour, disappointing many fans. Then there’s the small matter of Bieber clipping a photographer with his pickup truck while leaving a church in Beverly Hills. The paparazzo, Maurice Lamont, was taken to hospital with minor injuries and is expected to be fine. Lamont told TMZ that he thinks Bieber is a good kid, but is driving a truck that’s too big — and hence can’t see over the dashboard. Which is kind of comical. And speaking of church, the story that Bieber cancelled his tour for religious reasons may be correct, but the singer says it had nothing to do with the Hillsong Church. And it wouldn’t, because if the faithful are going to continue to soak Bieber for his money, they wouldn’t want him to ignore the gifts God gave him and stop singing, now would they? Security much? A young woman who was found inside Drake’s house in Hidden Hills, Calif., back in April has been apprehended at his house again. 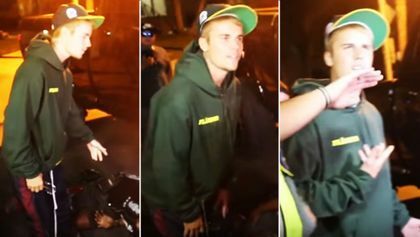 The 24-year-old fan broke in a second time this week, and was arrested for trespassing and assault on an officer. The house, which Drake dubbed YOLO, is in a gated community. This little bit of animated dog dropping has scored 0% on Rotten Tomatoes, which means that reviewers are unanimous in hating on it.